In 1989, OMA was commissioned by Euralille to masterplan 8,611,100 square feet of urban activities in the urban quarter of Lille, France. Approximately 27 years later, the last free parcel of Phase One is filled. The project, Euravenir Tower, was designed by Paris-based architecture firm, LAN Architecture, at the foot of Avenue Le Corbusier. 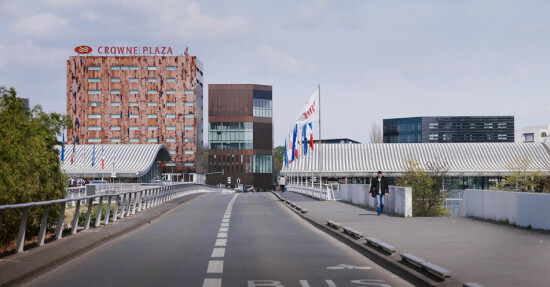 The site "occupies a strategic position at the intersection of major axes and close to well-known landmarks of Lille’s infrastructure, such as the Lille-Europe train station and the ring road, among others," LAN said in a statement. "This location inspired us to view the project as a way to articulate and make a heterogeneous ensemble of architectural and urban elements work together." The building is wrapped in large, clear, glass windows, giving a 360 degree view of Euralille. A copper facade varies in perforation patterns and is either smooth or corrugated, depending on the neighboring condition. "The perforations give depth to the facade, while the corrugation provides a sense of movement," LAN claimed in a statement. The ground level of the tower provides public space. Because LAN was prohibited to build to the edge of the parcel, the firm designed a portico that "provides a sense of porosity as well as protection from inclement weather," says LAN, "It is a lively outdoor space where people who live and work in the building can mingle with passers-by and shop customers." For more information, visit LAN's project page here. A new convention center in Texas is wrapped in a skin of delicate copper circles that appear to float in midair. Located halfway between sister cities Dallas and Fort Worth, the Las Colinas master-planned community is an ideal place for the newly opened Irving Convention Center. It is also a natural setting for the copper facade that architect RMJM Hillier designed for the 275,000-square-foot, $133 million project. Fabricated by architectural metal and glass innovator A. Zahner Company, its angular walls rise from the ground like a sun-baked geological formation. Up close, these walls look surprisingly delicate. To let light into the center’s expansive interiors and avoid a conventional convention-center design, RMJM and Zahner designed a skin of perforated copper that wraps the building’s cantilevered forms. 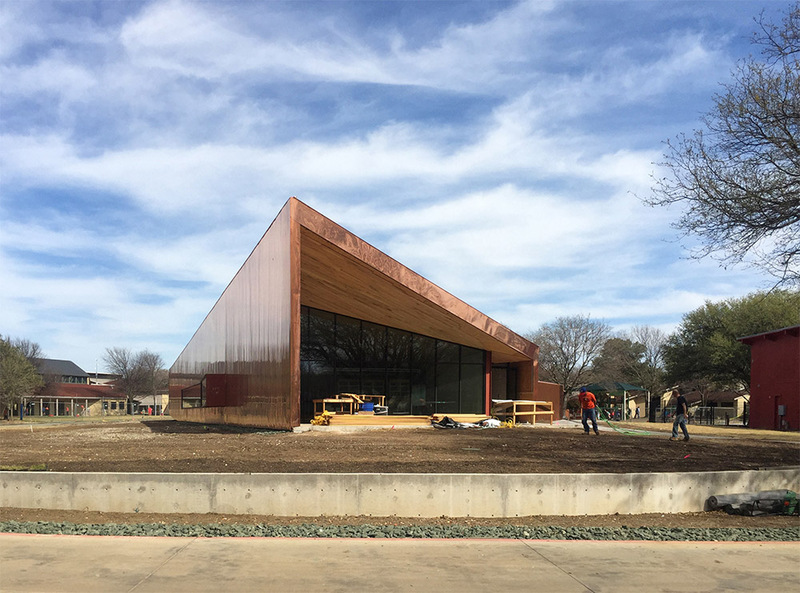 Inspired by the town’s Robert Glen sculpture of nine bronze mustangs, and by the copper roofs of nearby Williams Square, the facade reflects sunlight during the day and allows the facility’s lights to shine through at night. The skin’s custom perforations and bumps were fabricated using Zahner’s trademarked ZIRA (Zahner Interpretive Relational Algorithm) process, which the company developed to expedite complex perforation and embossing projects. 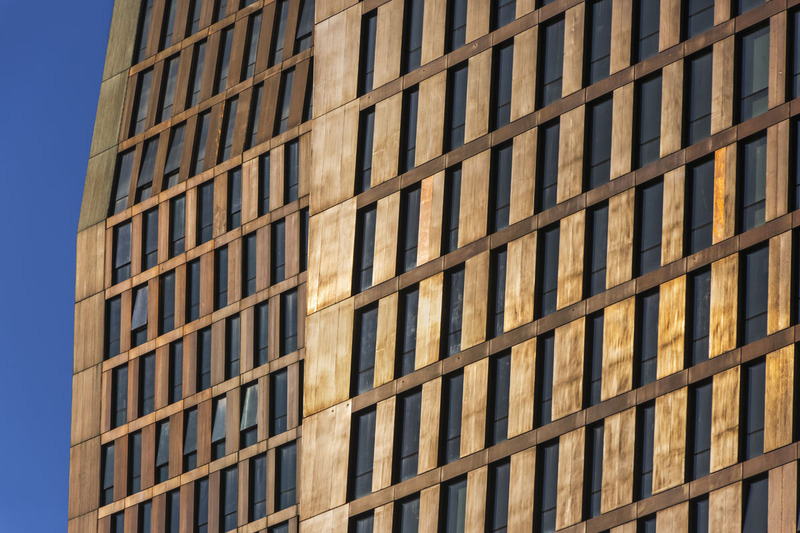 Here, RMJM envisioned the copper panels overlapping at several points on the facade, so the firm experimented with multiple layers of perforated material to understand how the cladding would layer to form new patterns. Once a digital map had been drawn, Zahner translated the image into bumps, dents, holes, and shapes that were reproduced by machining equipment in its shop. The resulting pattern changes with light and vantage point. From close range, its circular shapes appear to float because the copper bridges of the pattern are so slender. At night, the convention center’s lights penetrate some areas of the skin, making the shapes translucent. The mill-finish copper cladding will also let the building evolve over time as the bare surface undergoes gradual patination. The material has already begun to darken, its bright finish turning to brown umber since crews began installing the panels in 2010. This color will eventually give way to deeper greens and blues, a patina that will protect the surface from further corrosion. Even for those who don’t go inside, there are plenty of reasons to visit the building, but the facade serves its purpose on the interior, too, providing reduced lighting and cooling costs for the facility, which is targeting LEED certification. Having already hosted its first non-civic event—the annual spicy food exhibition, ZestFest—the center is on track to be a new hub for convention-goers far and wide.